For a few months in 2006, I changed the banner graphic of the site every month to reflect the season. There are a couple of things that I wish I had done differently during the last five years as far as Just Hungry was concerned. If you are a newish food blogger, or any kind of blogger, perhaps this will help you avoid these mistakes. From about August 2004 to February 2005, I just got too busy with other things in my life and stopped posting on the site for more than six months without explanation. I even got some concerned emails asking if I was okay. This was particularly bad timing for a variety of reasons. When I did come back, I found that the site was almost forgotten, especially in the general food blogging community. My readership was way down of course, and it took a long time to get it back to pre-hiatus levels. I still think that if I hadn't taken such a long time off, Just Hungry would be much better known than it is and so on, but there's no taking that time back now. Anyway, if you plan to make your blog, any blog, grow as much as possible, don't take very long and unexplained vacations from it or people will think it's dead! This subject includes some things I did do, some I didn't do, and some things I occasionally get asked about. If you have already decided that you are not interested in making money from your blog, then you can skip this part. Earning money from a blog is not as easy as some people will make you believe. There are lots of blogs out there that cover this subject in depth (Problogger is a good place to start), but here I'd like to talk about some things specific to food blogs. Keep in mind also that maintaining a food blog is really a lot of work. Think about it: A typical food blogger spends lots of time and effort cooking things, photographing the results, and then finally writing up an interesting post about it including a recipe that has to work properly. Or, they go out to lots of restaurants - usually paying their own way, unless they are very lucky and have a sponsor somewhere. Most well known food bloggers invest in a good quality camera to take good photos, not to mention other gear like tripods, macro lenses and even studio setups. Some even go get special tableware and props to display their food to the best advantage. And usually, food bloggers have to do all of this by themselves, or with one partner. Joining an ad serving group that serves theme-targeted ads, such as BlogHerAds, BlogAds, etc. I have done all but the last one. I don't earn enough from either Just Hungry or Just Bento to quit my dayjob (and neither do I want to at this point really) but the revenue is non-negligible. It's now definitely my second job - one that I enjoy a lot, but nevertheless a job. Other food bloggers I'm sure have also done a combination of the above. Quite a food bloggers have published books - the revenue generated this way of course depends on how well the book sells. One more thing: Whenever you decide to monetize your site, I think it is very important to be sure that you are happy with what is being advertised. For example, I am very happy to have Japan Centre in London as an advertiser, because I was a happy customer before we even got into contact, and their store is a perfect fit for my sites. I would never carry an ad from a company or for a product I disliked, no matter how lucrative the offer may be. I also try to keep an eye on the kind of contextual ads that appear. You want to present content that you believe in to your readers at all times, and that includes the ads. I've rambled on a bit today, but finally on to today's giveaway! Today's giveway is a bit off track maybe, so I am anticipating less interest in them than the other items (but hey, you never know.) I know that a lot of people who visit Just Hungry and Just Bento are interested in Japanese culture in general, and many are crafters and knitters. I love crafty things as much as I love cooking, and I could extend the day to about 32 hours instead of 24 I'd start up a crafty blog. 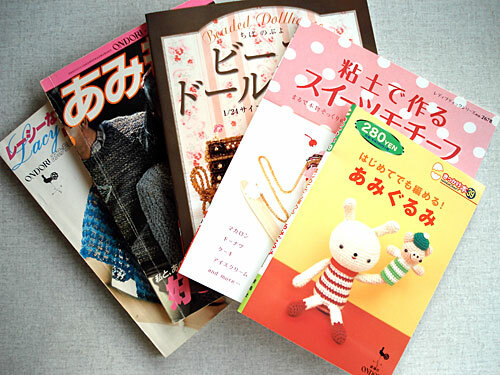 Anyway, I have tons and tons of Japanese craft (手芸, shugei) books, and these come from my vast collection. (Please feel free to spread the word about this giveway to craft or knitting related sites and so on.) I apologize for the wonkiness of the photos below. It has both knitting and crocheting patterns. All are in chart form as with all Japanese knitting books. Sizing is small (e.g. bust circumference around 80cm) though I guess experience knitters/crocheters can adjust them. This is a vintage book, so there is some minor creasing and so on, but the photos are clear and unfaded and the pages are clean. 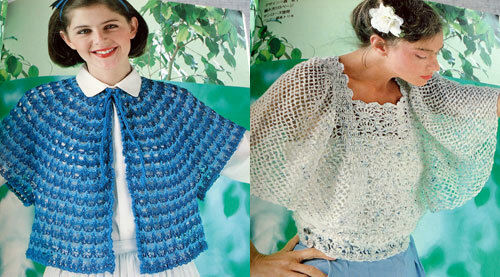 Sizing is more generous than the lace knitting book - around 85cm chest for women and 100cm for men. All charted and/or with Japanese instructions. The designs are fairly timeless. Again, this is a vintage book, so some pages are a bit dog-eared and so on, but is otherwise in good shape. It uses air-drying resin clays (the standard in Japan) but you can adapt the methods to oven baked clays like Fimo. The book is in brand new condition. A Boutique Mook (no. 531), published in 2005. 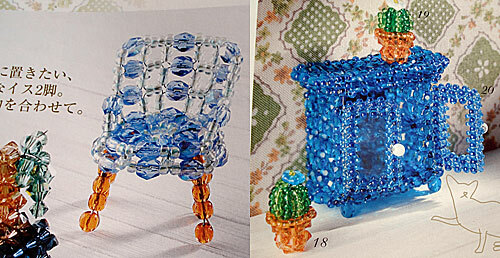 This one is rather unusual I think - furniture (chairs, desks, bureaus, potted plants, what have you) made out of beads! It has beading charts for you to recreate these glittering tiny marvels. The book is in brand new condition. An Ondori booklet published in 2004. It's a beginner's guide to making amigurumi, tightly crocheted little critters. Everything is charted, and is crochet only. The book is in brand new condition. So there you have it. Even if you never make anything in these books, if you are as fond of handcrafts as I am you'll enjoy just looking through them! DEADLINE: Your comment/entry must be posted before Midnight Greenwich Mean Time on Sunday, December 7th. This giveaway is now closed. Thank you for participating! The winner will be announced next week! Submitted by maki on 2008-12-04 14:16. Oooooh! I want want want want!!! Oh, the little crocheted animals are too cute! This is one prize good enough to bring me out of hiding! I've been reading your blog for ages now- Thanks for having such interesting content, and congrats on your blogaversary! They are both my passions! I love to sit & knit away at something & give the item to family & friends. I knit kid chemo caps for a cancer hospital here. I have a girlfriend who always supplies me with the yarn for any baby blanket I crochet for her. They make nice gifts for a baby shower & they are something pretty & hand made that not very many people do any more! Keep up the work on your blogs! They are wonderful! Yay for Japanese craft books! I agree, even if I end up making nothing, it would be fun to just page through these. Oh wow, I knit and crochet and am interested in trying my hand at polymer clay craft. This is perfect! I would love to have any of these books. Thanks again for giving them away! 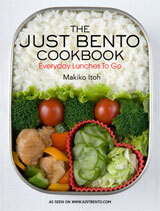 I'm really enjoying your series of posts here and on Just Bento! Thanks for sharing these too. 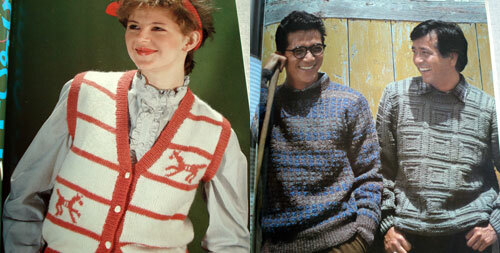 Those knitting books from the 80s look awesome! I love Japanese craft books! I love Japanese craft books! Book 3, 4, and 5 look so cute. I'm a knitter, and eater, and recently new reader to Just Bento...hadn't really dug into Just Hungry yet, but I'm loving it! I found Just Bento when a friend sent me home from a visit with a packed Bento that was exactly perfect in size for my journey! I'm hooked now, and my son loves them! I'll be sooooo unbelievably happy if I get this prize. I've always wanted to learn how to make such adorable crafts! Thanks for introducing me to the books. Location: USA. Yes, I really love crafts as well! Haha, i have bought so many that my mum sometimes gets angry that I don't even make them! I would be stoked to check these out! these just keep getting better. So much fun. I've tried amigurumi, with terrible results (mainly stick with knitting). Would love to win a craft book! I am still considering creating my own blog and I appreciated a lot reading today´s post. Thanks so much! You have so rich experience and everything, it is so pleasant to learn from you. I would like also to join the giveaway this time, once, handworking is one of my passions :). Thank you so much for talking a bit on how hard it is to run a food blog. It is a labor of love, but it is still a job nonetheless. Like you said : it is a second job, one that I love, but a job no matter how you look at it. i love japanese craft books and wish I can spend all my money on them . i just came back from studying in japan and love to make some of the stuff since I wasnt able to bring back any of the craft books i bought due to luggage rerstrictions. I have to tell you, if my name is drawn... burn it! Whenever I am bored (as in this Thanksgiving, my daughter now has a new hat, gloves, and scarf) I knit. Everything. And use... none of it! My husband will thank you for ignoring me. Side note- Great tips that I keep forgetting about blogging. Except the money one, I don't expect anyone to read mine, much less make money. It's more of my brain dump for everything I'm learning. Great site! Thanks for the info about food blogging-that was interesting to read. I want this stuff. I knit! I cook! 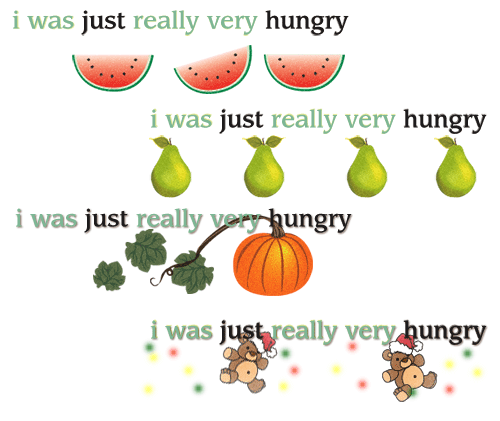 I eat! I make stuff out of beads! Good advice about blogging, too. Those are some great tips! I've not thought about having a blog for a purpose (mine is more of a diary), but it's interesting to see how much work it is for people who do. Thank you for sharing! The best thing about Japanese craft books is all the pics! YOu don't have to read Japanese to make the projects! The books look excellent, but they are only gonna be admired by me, cos as much as I love craft (the type, I can do with my kids with two "left" hands), I can't knit or crochet.. But thanks for sharing so much about your experience in starting up the blog, I know it is no easy task maintaining it and perservering for so long, even if it's one about your interest. And.. just in case.. you ever decide to start writing a book ! Sign me up for a copy !! haha.. a pre-pre-pre-order of sorts ! my wife collected these books while we were living in tokyo. I would love to have that before January 2010 ! Maybe I can make a present for 2011 December Christmas ! oh wow, these look amazing. my roommate is studying fashion design and i think she would love the knitting one. So cute I almost fainted!!! Better chance for me, lol. i wasn't really gonna enter this draw.. but my dear mother wanted it when she saw me read your blog... HAHA! omg!! Those books are so cool!! more importantly, my obachan would love them! and unlike me, she could actually read them. about a year ago she started teaching me to crochet and knit; it would be such a treat to give her Japanese craft books! 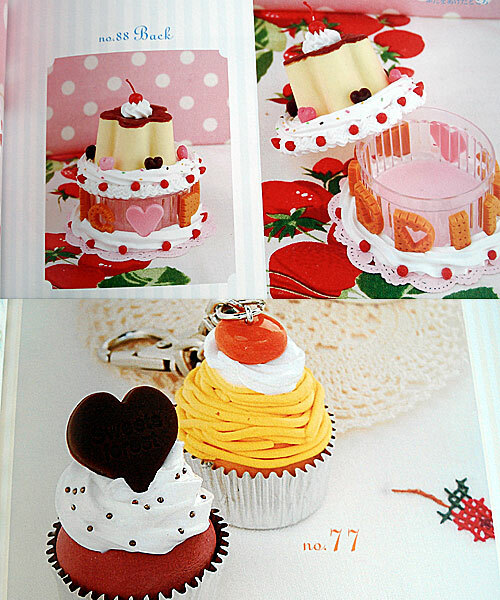 The Clay Sweets book reminds me of the dim sum cupcakes you linked to yesterday. You are so darn forthright. You are so darn forthright. Very brave. I love crafty things. I am hoping to become crafty. Lily in Las Vegas, NV, U.S. 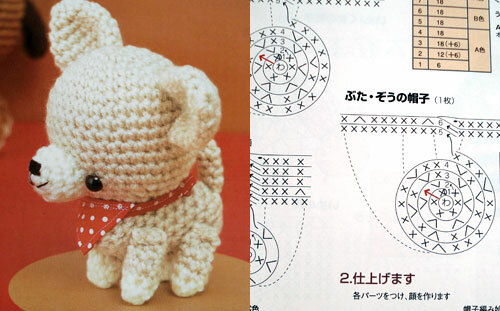 I really want to learn how to crochet those dang cute toys. I can only knit, and only in a straight line... Some day! It would be cool if you did a crafty blog. When you get that time machine, let us know. For real. Maki was right on the dot when she assumed that many of her faithful followers were also crafty people! This is my attempt at getting these nifty Japanese craft books! Maki was right on the dot when she guessed that many of her faithful followers were crafty people! Sign me up for craft books any day! It didn't submit the first time, and I resubmitted it. Sorry! I've been thinking about making some of the amiguri critters. They are so cute!! I have been meaning to learn how to crochet just so I can do amigurumi! Unfortunately I have had too many knitting projects all lined up and ready to go, so I haven't had any time for crochet. Maybe I'll start a food blog one day...when I can get some good lighting. Such great giveaways! I have my fingers crossed. Thank you for doing them. Thanks for sharing all the wonderful advice with us! I've been wanting to try amigurumi for a while, and I've been trying to learn Japanese. If I won these books I think it would spur me on to learn more faster! I just started to follow your site about a month ago and from what I've looked at it's something that I'll be looking at for a long time in the future! Clay sweets, so lovely. If I make them, it will be hard not to taste! Those are some fun looking books! oops, forgot to put country in my first post - but it's USA! love the books - such fun it was to shop the depaato stores in Japan, there was so much variety and supplies - everything so kawaii ne! thanks! I love to knit and crochet and do other crafts. I'm teaching my daughter, who would love to learn amigurumi too. Thank you! Ooh! :) This seems terribly selfish for me to comment -now- after reading your blog silently for quite a while, but I can't help it... the amigurumi and miniatures are too cute! I am not putting in for the drawing, since I have more craft projects than I can handle already - just wanted to say that these are awesome. !!! The craft books are so cute... do you know if they sell English versions? Sage advice on the food blogging. Please know that we all really appreciate the work you put into both blogs! thanks maki! these look great! It's been a while since I crocheted and this would be a great way to do so. Your site has been a great resource for this beginner - thank you! I'm really boring and really like doing stuff like this!